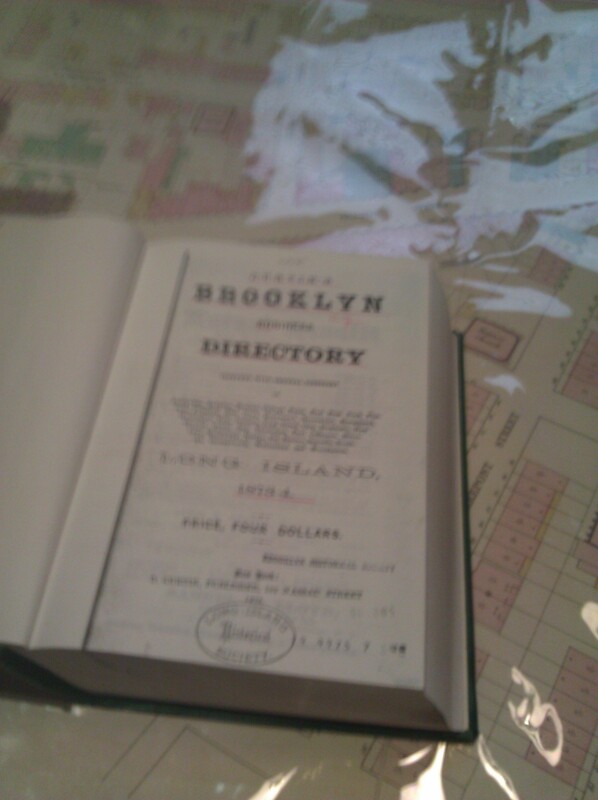 The time that I spent at the Brooklyn Historic Society has had a great impact on the way I think of documents of Fire, Disease, and Disaster and plays an important role on how a city will develop. One of the things that I learned from spending time there was how we still look back at the past to learn in the future. I keep hearing that we study history so we learn from our mistakes but when you start to see the documents and photos and see how it changes the way a city or committee was built, it makes a big difference. Throughout my semester at City Tech, I have learned a lot but in my English class we were always trying to relate things to one another or force on Fire, Disease, and Disaster. The Brooklyn Historic Society has helped me to see how all these events have helped to shape how Brooklyn was built and way they have the fire codes and laws that it has now. Even in class we have read short stories about people that have learned the importance of documents and how it has an impact on their lives. I remember the first time I saw the Brooklyn Historical Society; the first thing that stood out to me was how the building looked compared to all the other buildings around it. Just by the outside of the building you could tell it was one of the oldest buildings around there. As soon as you walk inside the building you would get a historical feel. I got this feeling while walking up these big wooden stairs and entering the archive room. I never saw so many details go into the columns that looked like it was supporting the whole floor and ceiling. When we walked in to the room the librarians asked us to signed in and put away our stuff, then divided us into groups. My group got to look at photos and how Brooklyn has changed over the years. One thing that I realized while looking at all the photos was that Brooklyn ship yard and the big impact it has had throughout the years. We saw photos that were forty to a hundred years old where they showed the many different changes that Brooklyn has went through. They also showed how the ship yard has changed over the years and how the type of people that work there has changed as well. One change that was experienced was in the 1940s it was mostly women and then in the 1970 it was mostly men. I felt honored to have a chance to visit the Brooklyn Historical Society because it gave me a chance to learn something new. 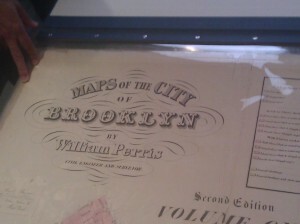 Another thing that caught my interest when I went to the Brooklyn Historic Society was the time I got a chance to look at lots of maps .One of them however, had me more interested than the others. The map that was the most interesting was Slum Clearance Atlas. I remembered this to be the most interesting because it was one of the first maps that I looked at when we first arrived. It was made by the Slum Clearance Committee of New York from 1933 to 1934. These maps showed the population in the boroughs at the time. It also showed how much of the people of the population were foreign born. There were also maps of the crime rate and monthly rent. Looking at these maps you could tell why some rents were lower than others and depict the reason for that. For example, places with higher crimes would have lower rate. Then, we took a look at the type of people that would live around there. The way they were able to put together this map was by the U.S. census in 1930. When I looked at the map most people lived right next to where they would work and most of the time it was crowded because of that. It was also the same areas that consisted of several industries. Looking at these maps helped me to understand how things might have played out in the 1930s. This showed how close people had lived next to their work and made me think how fast a fire or disease would have destroyed these people’s lives. One of the things that showed a big impacted on the Brooklyn committee was the Brooklyn Theater Fire. I was in a group that got to study receipts about how much it would take to bury someone. I found it amazing that it only took about 47 to 153 dollars to bury someone. When I thought about it, it seemed very little to me however it made me think about how much they worked for. After a while I found out that they only worked for 2 dollars to 22 dollars a week. Then it hit me that if they wanted to bury someone it would take a month’s pay check or even more to pay for it. This would be a lot for them and especially if the person that had died was the one taking care of his or family. These events have changed many of the laws and codes on how a building should be built up to this day. Some laws that were passed included concerns about getting from one floor to the next and the need for the maximum amount of people that could be in one place at once. Also they needed to have more than one way to leave the building. Without the document that the Brooklyn Historical Society has kept, most of these things would be lost or hard to find. After I found out about Brooklyn theater fire I wanted to know more. So I went on my school’s library website and looked it up. One of the articles that I found was called was “The Brooklyn Theatre Fire: 300 Died 95 Years Ago Today “By PETER KIHSS in the New York Times. The article talks about what happened that night and some of the accounts that people saw. This was a big help for me to understand how this event has change how building were made. To see that even after 95 years have passed and we still remember what happened, it’s fair to say that these documents serve as much importance of keeping track of the past events that occurred to avoid a repeat in the future. After the fire was controlled, only 183 people could be identified. One of the stories that I have read in class that shows how important documents can be is “Funes the Memorious”. There are many types of documents and artifacts in the world created by different people. We still use these to think about and see how things might turn out, or even try to find how it felt to be in the past. Some of the things we should save are documents written by a writer, an architect or an artist. These things should be saved because they can help us to understand their ideas for writing or making the creation that they had. An example of that would be the story “Funes the Memorious”. When you first read the story, you would not understand why it would be called “Funes the Memorious” until he starts to describe and state all the reasons why he thinks he is so memorious. As the story “Hamlet.doc Literature in a Digital Age” say, “We may no longer have the equivalent of Shakespeare’s hard drive but we do know we wish we did”. This shows that those documents are the ones we still wish to have kept to obtain all of his ideas and rewrite them so we could look back and see his thinking process. 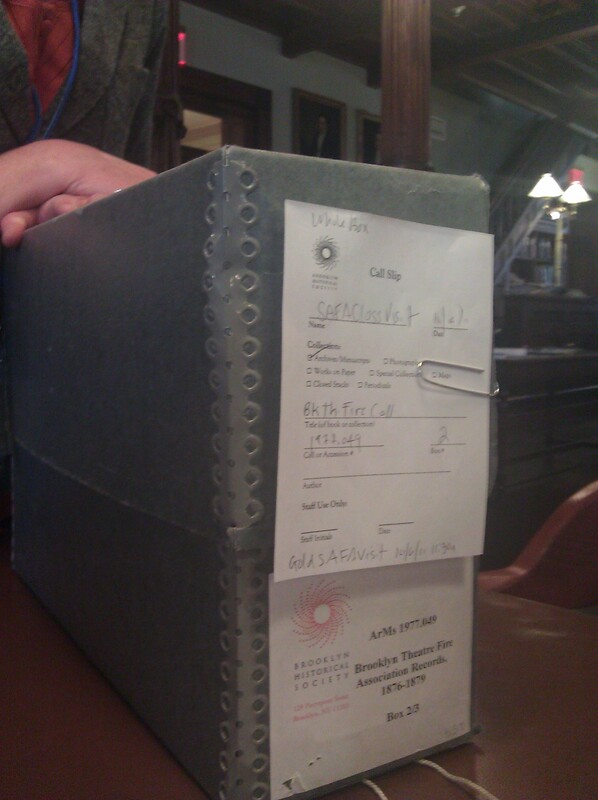 Documents help you understand how time has changed from 100 years ago to even up to a year ago. When I visited the Brooklyn Historical Society I looked at pictures that were taken about 30 years ago and I could see a big change on how life made the city and gave it its shape and look today. The cause of some of these events made architects rethink and build buildings more differently. If we could keep their documents of what happened and how he planned to solve it, it could help us understand how reason for constructing the building the way he did. These documents should be saved because it helps us to understand more of the reason behind the structure as well as helping architects in creating dynamic building schemes instead of losing them and later wishing we had them to know all the work they had put in. My time at the Brooklyn Historic Society was a great learning experience. I could never forget how it felt to walk in the first time to the building and how it changed my opinion of important documents. This has shown me that we still have a lot to learn from the past and that there’s always time to make improvements. It was a great spending time with my class mates learning about the place we walk around almost every day. Seeing how the place looked in the 1800s and looking at the same places now and knowing why it was built, you gain a sense of accomplishment. It has been a great semester spending time working in groups and having laughs with my friends that I made during the time I have spent here. It made it much easier to be able to talk to the other students in my class. Maps of the City of Brooklyn ,Atlas 1860 , call #32; Brooklyn Historical Society. This entry was posted in Student Post and tagged finalproject. Bookmark the permalink. This is the first final project posted. Well done! Thanks for getting us off to a great start. Please do include a Works Cited and please link out to readings when possible. Also, please give your post a title.